It seems like every year, pumpkin recipes become more and more popular. With websites like Pinterest and the growing number of food bloggers, we are flooded with more pumpkin-y creations than ever. I am just as pumpkin-obsessed as the next, and have already enjoyed my fair share of pumpkin spice lattes, pumpkin spice oatmeal, and pumpkin-stuffed raviolis. 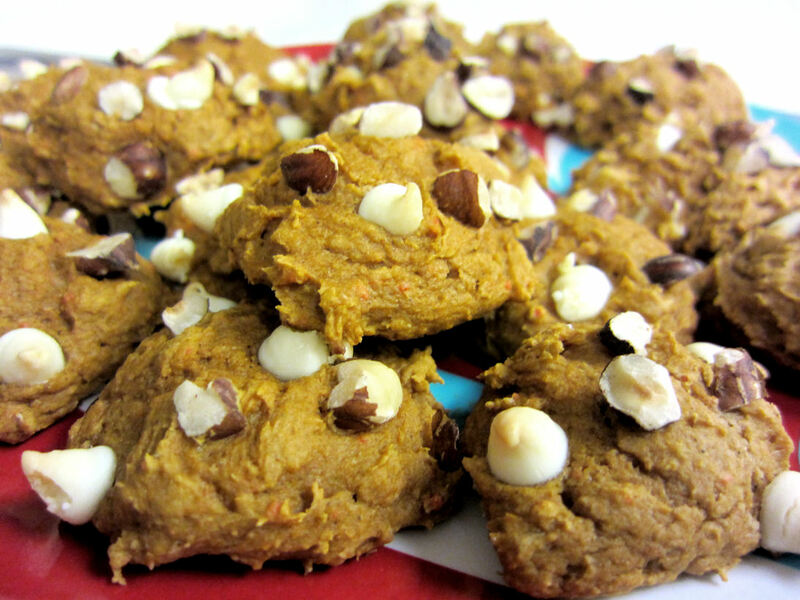 However my FAVORITE pumpkin treat is soft and fluffy pumpkin cookies. So the original recipe called for Spice Cake. But our Target had the smallest cake selection ever so we were given the choices of chocolate, vanilla or carrot. Carrot is close enough, right? I mean it’s got orange flecks in it…. The carrot ended up being a GREAT call because it has the cinnamony spices and color in it plus orange carrot pieces that we can pretend are pumpkin ;) Chelsea and I made a batch of milk chocolate chip pumpkin cookies first. C.) They are to be enjoyed with a Skinny Cinnamon Dolce Latte. Preheat oven to 350 and grease a baking sheet. Combine cake mix and roughly 12 oz of pumpkin in a large mixing bowl. 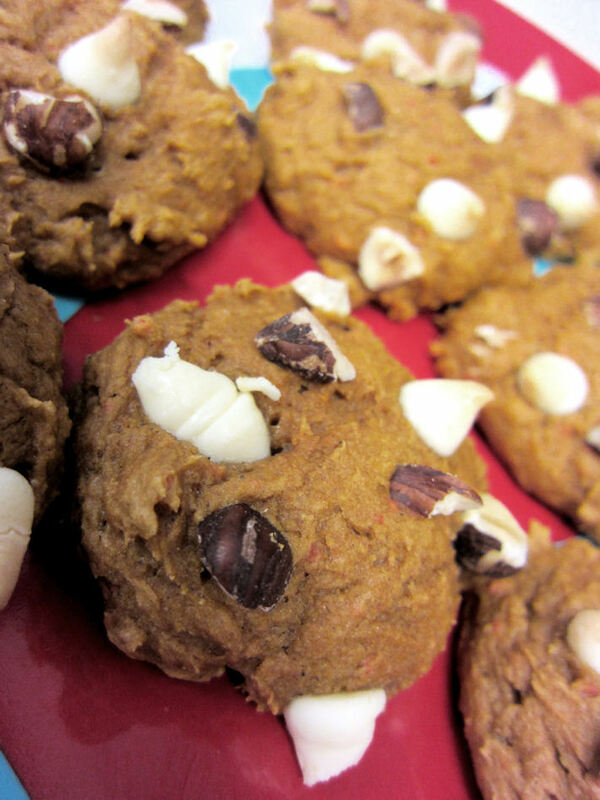 Add in chocolate chips, nuts, extra cinnamon, craisons or whatever your heart desires. 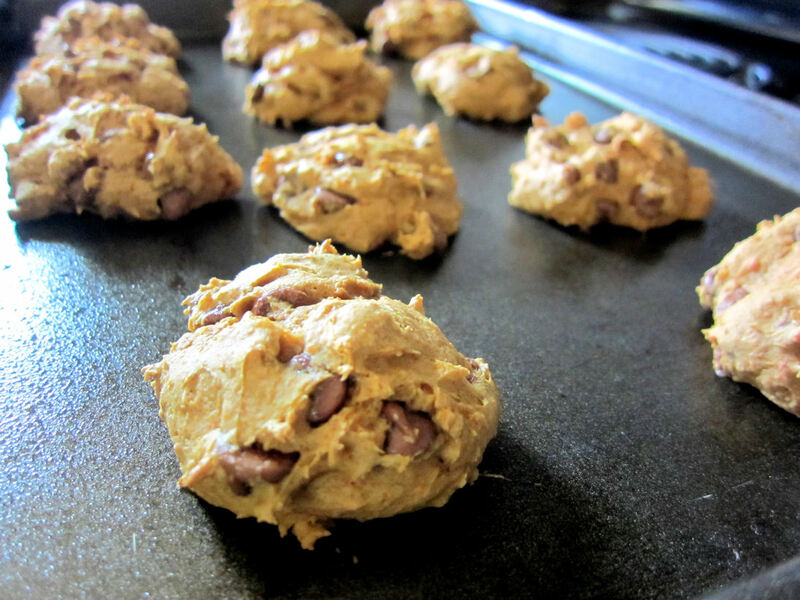 Scoop cookie dough as roundly on to pan as possible, because they will keep this same shape. This makes approximately 36 mini cookies, 66 calories and 2g fat each. The pumpkin cookies with white chocolate chips and chopped hazelnuts were a hit and the plate was empty before the party ended. They are seriously so easy to make, you could literally go to the store, buy the ingredients, make the dough, pop them in the over and be eating them within an hour. 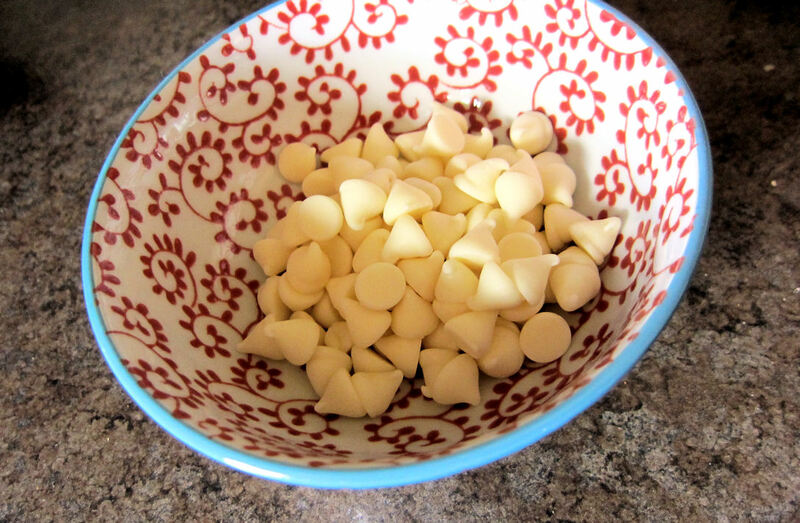 I have a feeling these wouldn’t be bad with a chocolate cake mix…. if anyone tries it, let me know! Posted on September 30, 2012, in Dessert and tagged autumn, Baking, Cookies, Cooking, Dessert, Fall, pumpkin, Pumpkin Spice Cookies, recipe. Bookmark the permalink. 8 Comments. I love the Starbuck’s addition ;) of course! 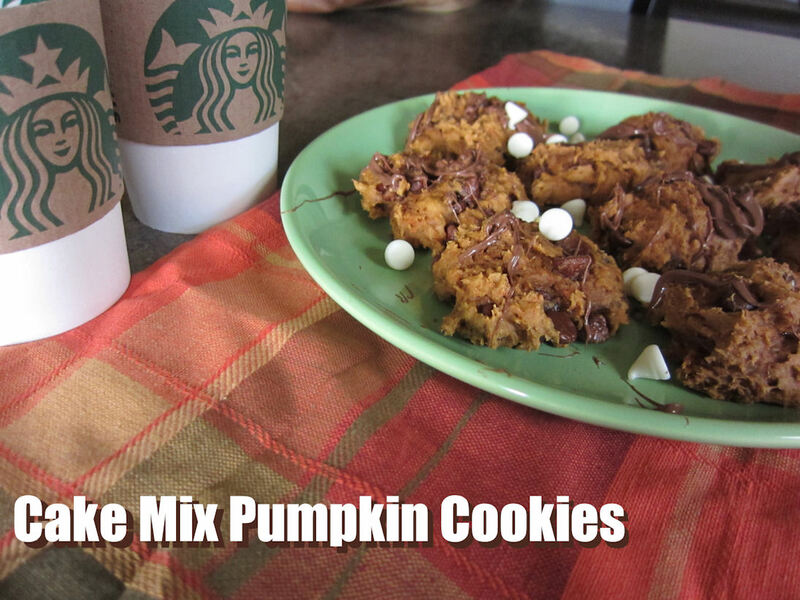 Now I feel like I need to make these cookies pronto! These look and sound soooo good. Let’s plan on making a batch next weekend (and we’ll eat the WHOLE batch) haha. I am so excited to try these. I bought a can of pumpkin because all of my friends said it was hard to find. Now I know what I can do with it! These cookies look great ! Think I will try this recipe myself.